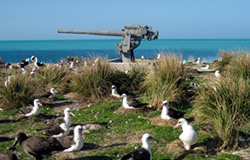 The Northwestern Hawaiian Islands, and in particular Midway Atoll, became a potential commodity in the mid-19th century. 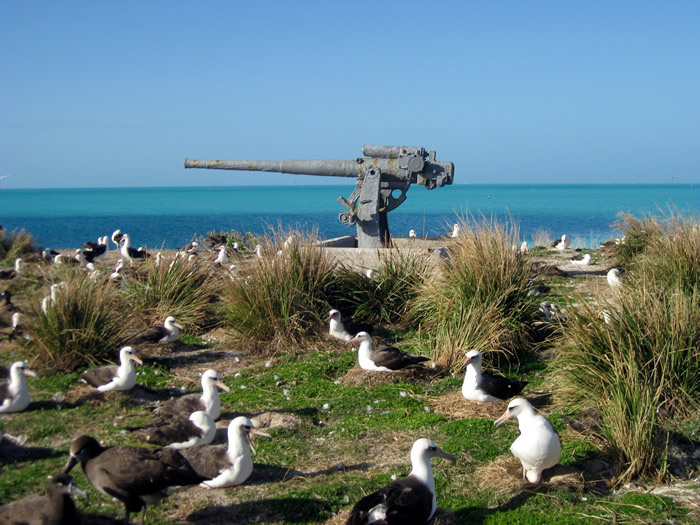 The United States took formal possession of Midway Atoll in August of 1867 by Captain William Reynolds of the USS Lackawanna. Shortly afterwards, the USS Saginaw, a Civil War-era side wheel gunboat, was assigned to support improvement efforts at Midway where a coal depot in support of transpacific commerce was to be built. For six months, she served as a support vessel for divers as they labored to clear a channel into the lagoon. In October 1870, the unsuccessful operation was terminated. Saginaw set course for nearby Kure Atoll to check for castaways before returning to San Francisco. 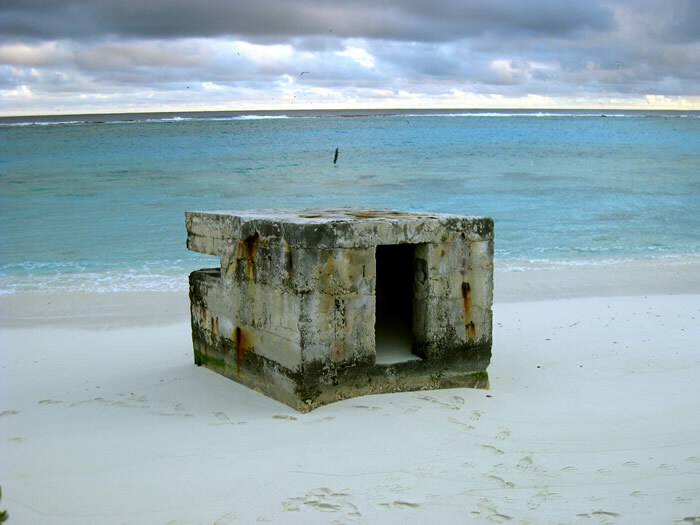 The ship would meet a tragic end on the reef at Kure Atoll where she wrecked in the middle of the night. Midway's importance grew for commercial and military planners. The first transpacific cable and station were in operation by 1903. In the 1930s, Midway became a stopover for the Pan American Airways' flying "clippers" (seaplanes) crossing the ocean on their five-day transpacific passage. The United States was inspired to invest in the improvement of Midway in the mid-1930's with the rise of imperial Japan. 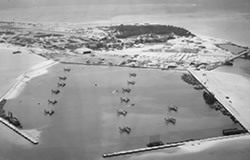 In 1938 the Army Corps of Engineers dredged the lagoon during this period and, in 1938, Midway was declared second to Pearl Harbor in terms of naval base development in the Pacific. The construction of the naval air facility at Midway began in 1940. At this time, French Frigate Shoals was also a U.S. naval air facility. Midway also became an important submarine advance base. 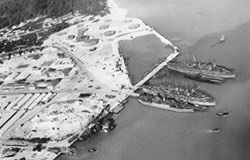 The reef was dredged to form a channel and harbor to accommodate submarine refit and repair. Patrol vessels of the Hawaiian Sea Frontier forces stationed patrol vessels at most of the islands and atolls (Linville, 2010; Braisted, 1985; Cressman, 1990). Midway was of vital importance to both Japanese and American war strategies in World War II, and the raid in June 4 of 1942 is one of the most significant events in the history of the naval base. In June 1942, the Battle of Midway took place 100 to 200 miles north of Midway Atoll. Four Japanese aircraft carriers and one American carrier were sunk, and the Japanese military was forced to withdraw from a planned invasion. 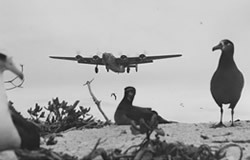 Although most of the battle took place far north, an intense air fight was waged directly over and around the atoll. Thirty-one crashes have been conclusively identified by archival research. Of these, 22 were American and 9 were Japanese. These crash sites are considered war graves. The Battle of Midway is considered the most decisive U.S. victory and is referred to as the turning point of World War II in the Pacific. 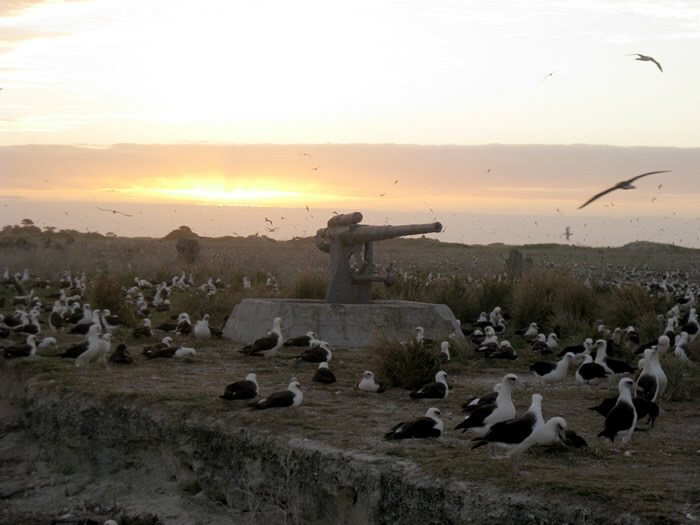 Midway Atoll has since been designated as a National Memorial to the Battle of Midway. 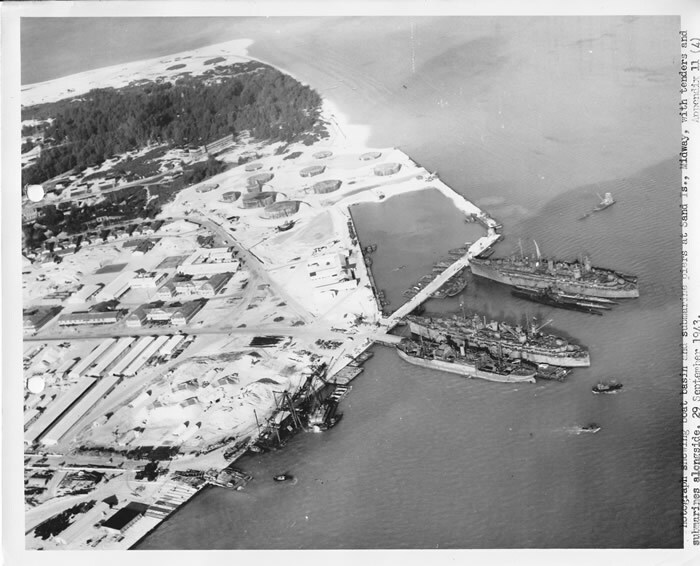 Planes of VP 13 and VP 102 in submarine basin at Sand Island, Midway Atoll, 29 January 1944. Credit: NARA. 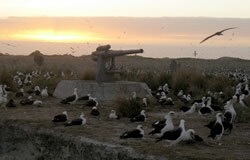 Braisted, William R. Midway Islands, U.S. Naval Air Station and Submarine Base, 1941-. In United States Navy and Marine Corps Bases, Overseas, Paolo E. Coletta and Jack K. Bauer, eds. Greenwood Press, Westport, CT. 1985. Cressman, Robert et al. A Glorious Page in Our History: the Battle of Midway, Montana: Pictorial Publishing Company, 1990. Linville, Nicholas J. Maritime Heritage Remote Sensing Survey of Papahanaumokuakea Marine National Monument, Northwestern Hawaiian Islands: Archival Research Report. 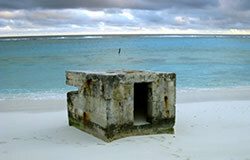 Prepared for Papahanaumokuakea Marine National Monument, 2010. 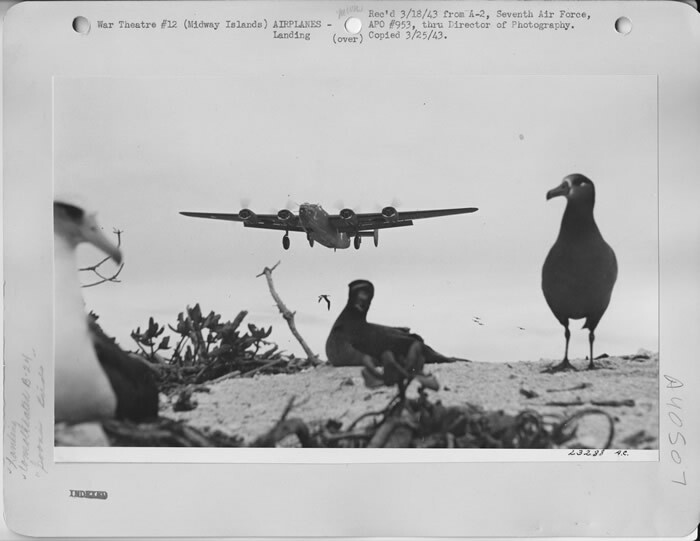 Airplanes landing at Eastern Island at Midway Atoll, 1943. Credit: NARA. 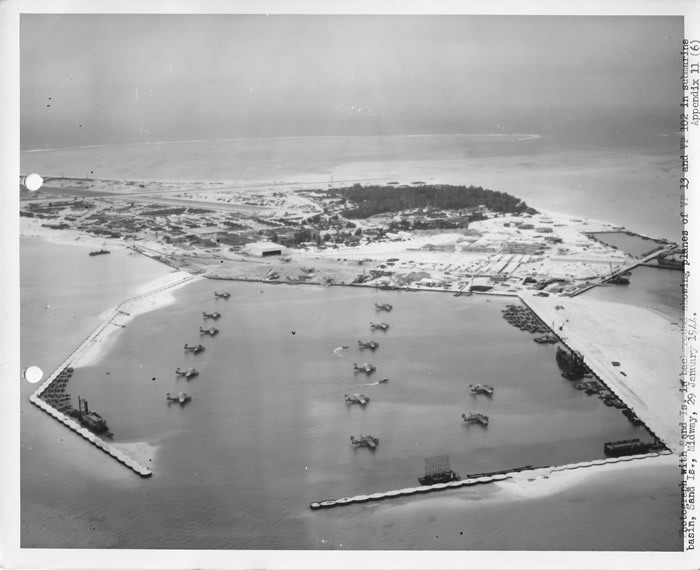 Boat basin and submarine piers at Sand Island, Midway Atoll on 29 September, 1943. Credit: NARA.